Clearly a ringless review’s required – which is difficult since it was the chief Ed’s idea (Mr Phillips) that put clues in a single list thus bypassing the unwanted letter in clue lists, and he suggested disregarding a Chamber’s reference this time – the credit is his. Tester and vetter Artix came up with many brilliant tricks excising that banned letter as well. Thanks, Artix! Chalicea has really appreciated all the tributes that came via Mr Green, and appeared in the Answerbank and TSTMNBM – sad that a grumpy and pernickety pair esteemed it singularly easy – hard cheese! The Listener needs a range between stinkers and gentle rambles (at least, that’s what I think). Publishing the Listener statistics in the reviews is against Mr Green’s rules but he has said that I may publicise the fact that a centenarian Cdr. D P Willan (RN retired) submitted a flawless entry – the first, we believe, by a centenarian – a fine achievement! Hares? Dave drew a few fine hares and they appeared in capitals as well and I see that Tim highlighted them all [surely rather inventively? Ed.] but the terrified little running hare at the left-hand edge was fleeing the pussycat and night bird (it was certainly eaten anyway – that’s the way it is in nature). The precise origins of this puzzle are a bit hazy to me, but I remember playing with the concept of an apposite message appearing in the grid in an infinite cycle, in various convoluted and in retrospect obviously impossible ways. I found Hofstadter’s law just by trawling the quotations on the Oxford Reference website looking for nice ones with a vaguely sciencey flavour, and it seemed to fit the bill. I remember solving Raich’s 2009 puzzle on the similar ‘Parkinson’s Law’ (with WORK expanding in the grid to fill the “time available for its completion”). After several grid designs and attempted fills, I settled on the circular shape which seemed to work well with the infinite loop theme, with the quotation running round the perimeter. Some of the unchecked cells in the irregularly-shaped perimeter look a little odd but the grid hung together overall, with decent entry lengths and unching as far as I could see. The quotation needed a bit of rephrasing to fit in the right number of cells, but since it was going to have its tail lopped off and attached to its head it didn’t seem unreasonable to change a few other words. 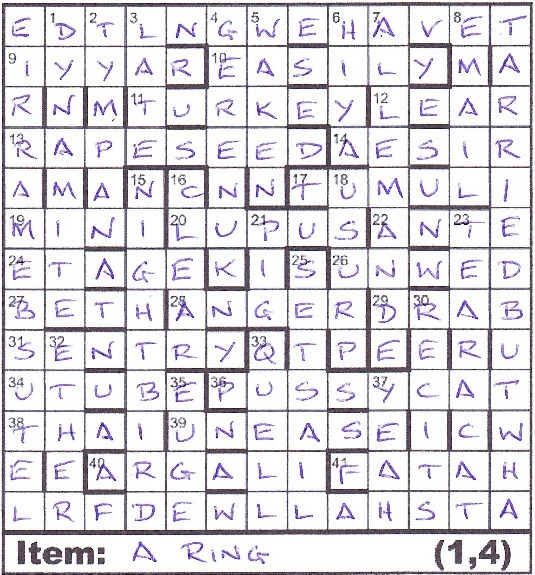 With assistance from Crossword Compiler and QXW I managed to get a fill that didn’t seem to have too many obscure answers. I chose misprints in the definitions to hide the HOFSTADTER’S LAW message, providing a pointer to the theme. I can’t say that using the incorrect letters rather than the corrections was much of a deliberate decision — I was most of the way through the clues before I realised I was doing them the unconventional way and wasn’t minded to go back and change them! In general I think using the corrected letters is preferable since it’s easier as a solver to tell you have the right one, but I don’t think a bit of variety every so often does any harm. Clue writing was a slow but not too painful process. Most clues didn’t need any special gubbins which helped, but some of the misprints were a bit of a challenge. I must thank Ken Clarke for getting himself re-elected and therefore not inadvertently ruining one clue. As may have been fairly obvious, solvers were originally supposed to provide the title I AM A STRANGE LOOP, written in the hole in the middle. This requirement was quite rightly removed by the editors, since non-internet-enabled solvers shouldn’t be expected to hunt through the library for what was essentially an ‘extra’ for the puzzle. I hope most solvers did find the book though and so understood the ‘strange loop’ of the title (also, the grid looks like a polo mint — I don’t know if anyone noticed this). At the time of setting I hadn’t actually read any Hofstadter, and still haven’t Godel, Escher, Bach, but I’m currently reading I am a Strange Loop, and am pleased to discover it’s full of the same sort of ridiculous recursion as embodied by Hofstadter’s Law. Setting my debut Listener has been a great experience, and I heartily recommend it to anyone who’s thinking of having a go. I hope Polo is the first of many! Solving the weekly Listener puzzle becomes something of an OCD doesn’t it? We were on an AutoReiseZug (one of those wonderful trains where you load your car then sleep happily as the train covers about five hundred miles and deposits you and the car at your destination). A friend kindly sent me the puzzle but I was unable to print it so we drew our grid and wrote out all the clues (on the back of this month’s Magpie – it was useful for that even if it contains a rather daunting D numerical puzzle by Ned and a Shark E) then solved on the mini table of the couchette until late into the night. A friend commented that he has often gone to similar lengths. His wife watched him with amusement as he wrote the crossword out longhand in the Atacama desert then went to great lengths to find a post office only to earn the mildly sardonic comment from Mr Green, some months later, that he had gone to great lengths to post a wrong solution. But wouldn’t it be just our luck to have such a complex and different grid to hand-draw! A polo ‘the mint with the hole’ indeed. Of course, as I read out and the other Numpty wrote out the clues, we had spotted that Apt justified his membership of the Listener setters’ oenophile outfit with ‘Drank just over half of alcohol getting wasted (4)’ (ALCO* giving COLA and producing an A misprint for ‘drink’) Cheers, Apt, see you at the bar! The grid filled steadily with Mrs Bradford’s help and a few doubts. YORICK had to be the answer to the last across clue, ‘In play he’d tested City, in command during second half (6)’ with YORK circling IC, but we needed to correct a misprint that must be in ‘tested’. ‘Rested’? I know Hamlet better than any other play and that seemed to be a very weak solution to the conundrum as that skull had been in the ground for some 25 years “And smelled so? Pah!” but it took me ages to realize that the corrected word was ‘jested’. Of course, we didn’t need to know since we were, rather unusually, spelling that name out with the incorrect letters. Our misprints spelled out HOFSTADTER’S LAW and the other Numpty had heard of that but, in any case, it was appearing around the perimeter of the grid as “IT WILL TAKE LONGER THAN YOU THINK EVEN IF YOU TAKE INTO ACCOUNT THAT … it will take longer than you think – we didn’t even need to check that the unchecked letters had spelled out TATTY THRIFT HOVEL but now that we have arrived at our destination I have been able to check that Hofstadter’s sequel was ‘I am a strange loop’, and a strange loop it was indeed. Thanks to Apt for an entertaining evening’s solve. The hares? We are in northern Germany and I rather expected to find a Hase in four letters in a straight line but the Hase was frolicking with a rather jumbled hare, with another couple looking on from above.